Are we making progress on the UN Programme of Action on Small Arms? Later this year, the countries of the world will convene at the United Nations in New York City to assess what progress has been made since 2001 when the UN Programme of Action to Prevent, Combat and Eradicate the Illicit Trade in Small Arms and Light Weapons in All Its Aspects (UN PoA) took effect. They will also be discussing the next ten years, and opportunities for advancing our global common cause – to prevent needless injuries and deaths from firearm violence, which still injures hundreds of thousands each year, and maims and traumatizes millions more. 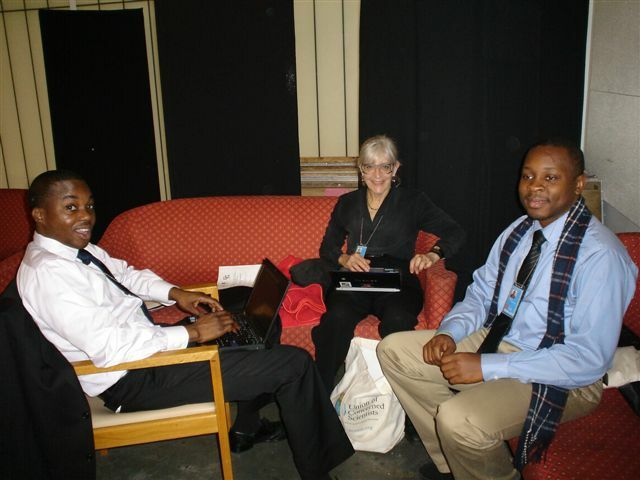 Hakeem Ayinde, Cathey Falvo, and Emeka Okolo (left to right) confer during the UNPOA PrepCom in New York. Today in New York, myself and doctors Cathey Falvo from the US, and Dr. Hakeem Ayinde from Nigeria, joined NGOs from around the world to participate in the first day of the PrepCom which will set the stage for the Review Conference in August. We have been afforded an interesting perspective on the proceedings as another IPPNW-Nigeria colleague, Dr. Emeka Okolo, is serving on the Nigerian delegation – and the Chair of the conference is Ambassador U. Joy Ogwu from Nigeria. The preamble of the PoA begins by stating “grave concerns” by UN Member states about “the illicit manufacture, transfer and circulation of small arms and light weapons and their excessive accumulation and uncontrolled spread in many regions of the world, which have a wide range of humanitarian and socioeconomic consequences and pose a serious threat to peace, reconciliation, safety, security, stability and sustainable development at the individual, local, national, regional and international levels,” and goes on to address a range of other concerns as well as actions to stem the illegal tide of weapons. Despite the comprehensive nature of the UNPoA, implementation efforts around it have been rather narrowly focused on arms management issues. The result has been that the technical competencies of entire disciplines such as the health community, that are centrally important to the issue, have essentially been ignored. We are here at the UN to ensure that demand as well as supply side dimensions of firearm violence are considered during these deliberations, and to call for public health measures to be integrated into discussions, and into national small arms action plans, in order to prevent injuries and deaths. Our work here is consistent with the origins of the IPPNW Aiming for Prevention program. Shortly after the inaugural UN PoA meeting in 2001, IPPNW convened the first major health conference on small arms and health, “Aiming for Prevention: International Medical Conference on Small Arms, Gun Violence, and Injury” held in Helsinki, Finland, in September 2001. This meeting launched IPPNW’s Aiming for Prevention program, and brought together for the first time hundreds of medical professionals, scientists, and public health experts to address the humanitarian dimensions of small arms violence and to strategize on approaches to preventing it. The focus of the PoA remains on the supply side of arms, and barely considers the root causes of armed violence, subsequent health impact, and approaches that could help prevent firearm violence. For example, the reporting template used by countries in biennial reports surprisingly asks nothing about programs or policies to help prevent violence at the country level. This despite the fact that the PoA in Part III (Implementation, International Cooperation and Assistance) paragraph 18 states: “States, regional and sub regional and international organisations, research centres, health and medical institutions, the United Nations System, international financial institutions and civil society are urged as appropriate, to develop and support action-oriented research aimed at facilitating greater awareness and better understanding of the nature and scope of the problems associated with the illicit trade in small arms and light weapons…”. This section makes it clear that addressing the root causes of violence is well within the scope of the PoA. But are we asking the right questions to determine progress in this area? A few states that spoke today noted the importance of investigation and research into causes and risk factors by both states and civil society, and the need to address prevention, but it has not been a topic high on the agenda. We’ll let you know how much progress we make in underscoring this need as the week progresses.